Big picture in case anyone is in panic mode. Nb Valerie is NOT for sale. Jaq and I saw in the New year of 2012 on board Uccello in the company of Derek and Carrie. 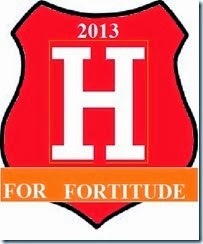 It is a lovely boat and so we have no hesitation in publicizing it`s sale although we will miss the crew. Full details can be found HERE Also there are links on the right of the page. Having found a mooring for the boat we have picked up a rental car and will over the weekend visit the kids and attend a Birthday BBQ. So just to play catch up on the blog we will with a few pictures whisk readers to Kingston, Upon Thames not Jamaica. Approaching Richmond lock on the extreme left. About two hours each side of high tide the lock is bypassed. Sluice gates that would create a weir at low tides are raised into the bridge arches enabling boats to pass below the bridge. Twickenham bridge, no worry of low canal bridges knocking the chimney off here. I think this was Richmond. Just look at the crowds a bit of sun attracts. Look how wide this river is. Yes that`s an island in the centre. Teddington lock and we leave the tidal part of the Thames. From now on it`s just the natural flow of the river heading for the North sea. As long as our English summer is dry the flow will remain gentle. While on the Thames boaters are mindful of the weather and keep an eye on the stream conditions on the web page of the Environment agency. 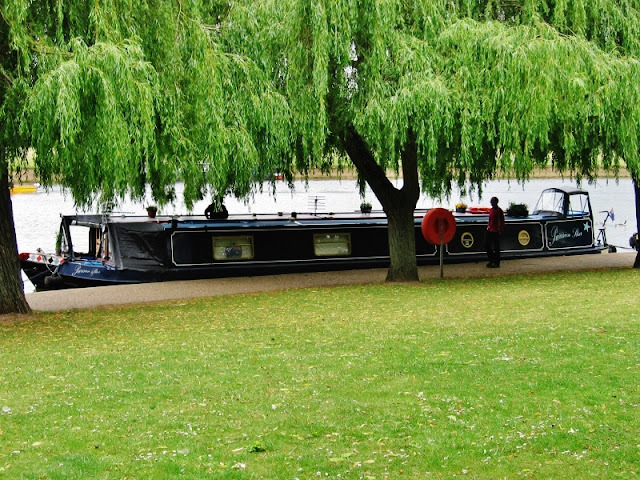 Our first Thames mooring at Kingston Upon Thames on the quiet side of the river. Across the river the pubs and bars that put liquid in the bellies of otherwise sensible lads making them do stupid things. Well ours is one boat that won`t have it`s mooring ropes released. A boat set adrift on a flowing river is very dangerous so my thoughts are safety first. A boaters take on a roof garden. Amusing signage outside a pub across the river. 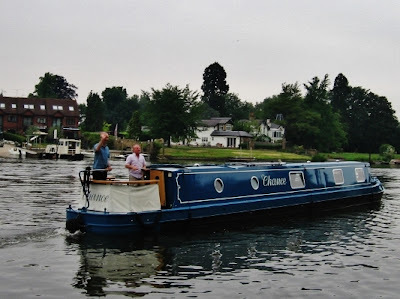 We came onto the Thames on May 25th, moored up up at Kingston-upon-Thames our first night, moved on to Hampton Court for two nights and then cruised up to Weybridge and moored for a night at D'Oyly Carte Island. The next morning we were off up the River Wey for three delightful weeks where we blogged like fiends trying to catch up this electronic travel companion as quickly as we could. The trouble lies not with Dear Sir but with me--the American writer gobsmacked by each thing that comes at me 'round a bend, over or under a bridge, or up the path! Add in time for work instructing my courses, the every day affairs of living and time slips away from me like a silken thread on a high wind. We will fill you all in about our experiences on the Wey but for right now we need to catch up some long overdue how'da dos and lamented goodbyes! As we came off the River Wey we caught up with James and Doug on NB Chance--boater's who also blog and whose path has crossed ours several times in the past year, although we've either been sleeping in or in Tesco's stocking up on groceries when they passed! Finally we moored up near each other and we invited them to dinner aboard NB Valerie. "Doug--can you believe it? I have a run of nine--and no wild cards!!" Doug and James brought the wine and we got to know each other over plates of Cheddar Cheese Risotto. The four of us enjoyed ourselves thoroughly with an after dinner game of Phase Ten, and Doug introduced me to a lovely new licorice liquor! Yummy! Never pass up a chance to party with the couple aboard NB Chance--they are good folk and good fun is to be had in their company. The next morning we visited their boat for coffee, cake and Doug's dreamy muffins. Theirs is a lovely floating home with comfy appointments. As soon as we parted--we parted again literally; James and Doug headed south down the Thames for Kingston and on to London, and we turned NB Valerie upstream through Shepperton Lock. One of the crazy making things about being on a river is the massive amount of insects which make their way inside; May flies and moths mainly along with a fair share of mosquitoes and tiny white bodies midges. Very late after dinner with Doug and James, we realized our open windows and bright lights were acting as a bug magnet. There were so many insects inside that as we washed up and put the dishes away they were swarming around our faces, in our hair, and trying to crawl in my ears! At the end of my rope (or tether as they say over here) and fairly tipsy on wine, I devised a scathingly brilliant plan to rid our floating home of flying vermin. We shut off all the lights except the ones in the galley. I went and stood out on the dark bow with doors wide open, and instructed Les to take the dish towel in hand and flap it at the ceiling, herding the bugs toward me, and shutting off the galley lights as he went, turning on the saloon lights to attract all the insects forward toward me. We did this (I say we but really it was Dear Sir doing the insect herding and much the better for all the wine he had with supper) in stages, shutting off lights behind and turning them on in front, Les flapping the tea towel madly as he went until finally he reached the bow stairs, where I stood outside. I flipped the switch on our large torch (flashlight for Americans), and stood like a combination of Lady Liberty and the man who flags in the planes at the airport, attempting to attract the thousands of flying things out of the boat. It was a combo of Rawhide and Give me your tired, your hungry, your poor...we sat giggling with wine and hysteria on the darkened bow. The next morning as we visited NB Chance we were mightily impressed by the fact that not one flying insect was to be found inside. I had thought they just wouldn't dare, but Doug set me straight on the facts: he sucked them all up with the Dyson! When we finally made our way to Royal Windsor to moor up, live-aboard bloggers Elly and Mick on Parisien Star pulled in behind us and breasted up with their traveling companions aboard NB Wyntons Folly. We had a short chinwag and introduced ourselves before setting off for a walk round town. It was lovely to meet Mick and Elly, who posted comments on our blog previously, making me feel much better about being a melancholy American. 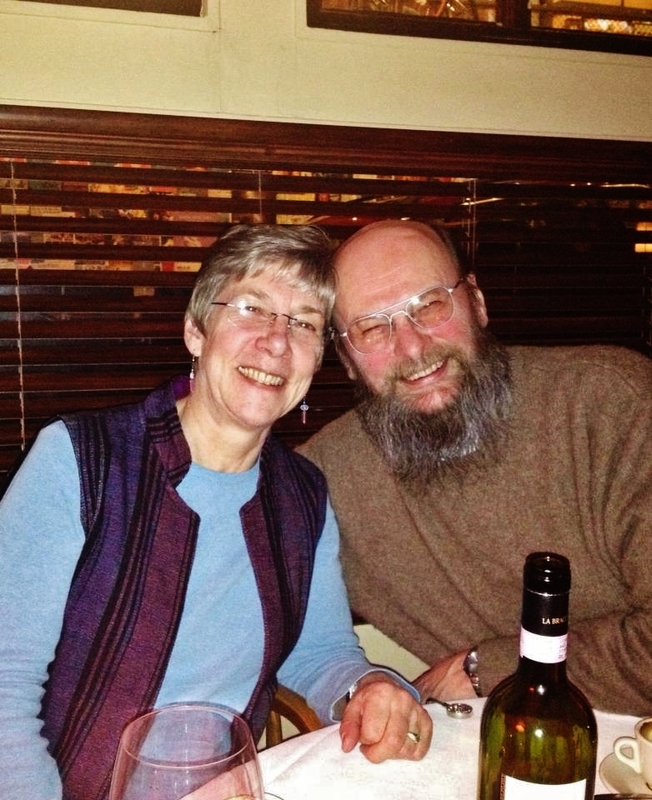 She is Australian and Mick is British by birth but has lived his life in Australia so they can both understand life in England in all its many permutations. The same afternoon as we sat at the dinette considering another blog post, Les' phone rang. It was Sue aboard No Problem to say they would be stopping by for a day. A dinner invitation aboard NB Valerie was forthcoming and to say I was excited would be understating things. "Oh Sue–the picture of Cowley tunnel is magnificent! I am going to wrap it around me and wear it like a shawl today. It is cold and bleak here and not just the weather. I had a visit from a certain Englishman of our mutual acquaintance who happened to be in the States visiting Las Vegas. He’s stolen my heart, and taken it–and the sun back to England with him." Les, Sue and Vic are dear friends, and Les had told Sue he was coming to visit me. She thought he might melt my heart--and he did! So it seems crazy that it took nearly two years for our paths to meet at last. It was a brilliant day--sunny and warm. Sue and Vic stopped to chat on their way into town and back out again, inviting us over that afternoon for tea. They were moored up on the far side of the little island that skirts the edge of the Thames here at Windsor. 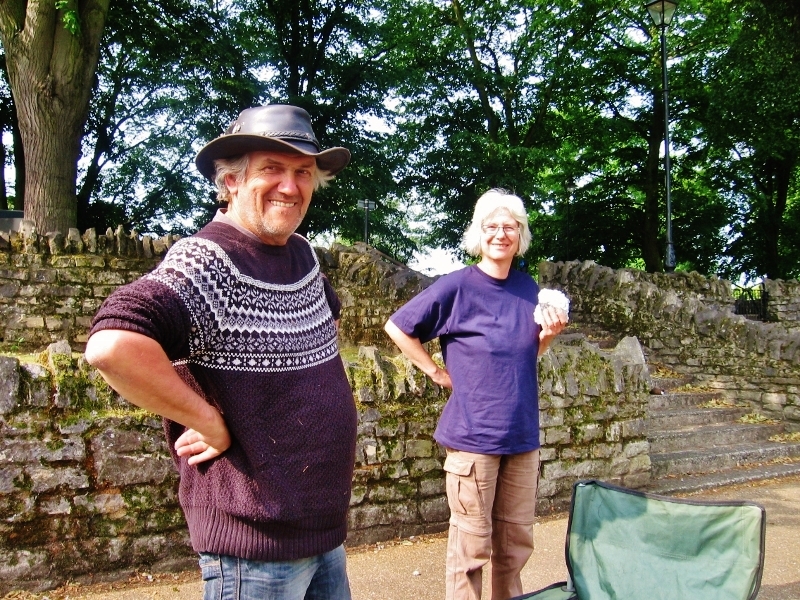 Les and I held hands as we walked along over the bridge and sauntered across the grass to their brilliant mooring; plenty of space for the Penny and Meg to run, a bit of privacy from gongoozlers walking the towpath, and room to set out a table and chairs--Lovely! Trust Sue and Vic to know the best places to moor anywhere. 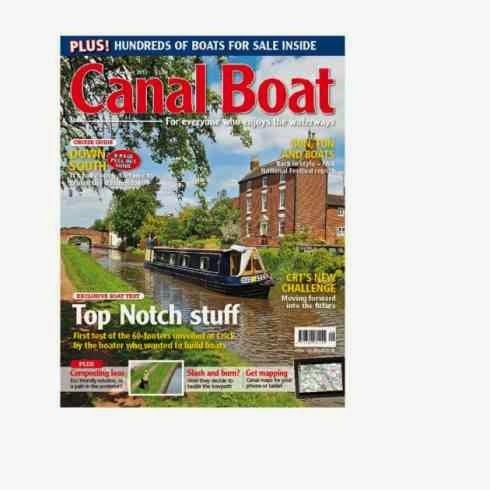 They have been living aboard, continuously cruising for fourteen years and their blog is a must-read for anyone serious about a life on board a narrow boat. Sue invited me aboard NB No Problem for a tour. 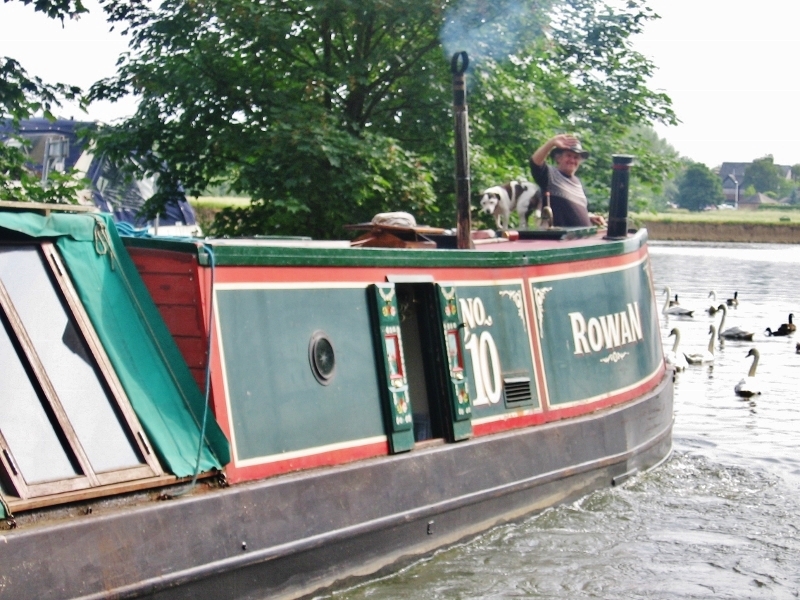 At 69 feet it is a lo-o-o-ng, narrow boat. It is also an extremely comfortable home, filled with love, laughter, memories and mementos of their life. Outside, yet another live aboard boater/blogger turned up--Ken aboard NB Dogma, whose blog titled Badger Sandwiches is a good read. (Nice to meet you Ken and we hope to see you and Sheena again sometime.) We all sat and had tea and scones, laughing as Les and I shared some of our more memorable "cultural moments" as we call them. Later that night Sue and Vic joined us, bottle of wine, a jar of Sue's homemade Tardebigge Flight Wild Fruit Jam, and lovely red roses in hand, for dinner, drinks, and a much anticipated evening. We share a great deal in common, we four--life experiences, desires, life lessons, and goals. Like us, Sue and Vic like to catch up with other boaters, share a meal, enjoy a laugh, have a natter, and then move on to a bit of quiet on their own, enjoying the peace and beauty of this life. I feel now, nearly two years after landing here, that I have been well and properly welcomed to our boating life --by the Goddess Mother and Father of continuous cruisers; two people who appear ordinary in every way--and yet are mythic to me as they embody the life of which I dreamed. Thank you Sue and Vic for folding me into your lives as a friend along with Les who you both obviously adore! WHO'S THAT KNOCKIN' ON OUR DOOR? This morning as my best beloved and I lay in bed, curtains closed against the morning sun, the day just beginning to hum around us, we woke to a gentle rhythmic knock. "Les I think someone's at the door." "Hmmmm? No it's just the swans pecking the side of the boat." He rolls over and takes the covers with him. "Not unless they've learned how to peck in a gentle syncopated rhythm it isn't." I got up and flicked the bow door curtains, seeing no one outside. I decided to put on the kettle and get dressed. Les joined me for a cuppa on the sun splashed bow as ducks, Egyptian and Canadian Geese, and Mute Swans gathered 'round in hopes of a hand out. Just then I looked up and saw another larger than life live aboard boater on a boat not his own--the mythical Maffi was at the helm of a replica working boat, NB Rowan. Les called out and I waved my arms. Together we caught Maffi's attention and he turned the boat from the main Thames stream, bringing it in to moor up in front of us. Maffi waving goodbye; Mollie is steering! Soon enough Maffi, Mollie, and his friend Sara joined us for tea. We had a good chinwag and found out Maffi was moving this boat from Oxford to Royden for a chap who had just bought it with Sara and her husband Mark aboard to keep company. It was lovely to greet them all--brief though it was. We look forward to having a longer visit when we come up the South Oxford in late August or early September. As Maffi and crew waved and went on their way, Les and I prepared for a walk into town to watch the changing of the guard at Windsor Castle and a stroll over the bridge to Eton--but that's for another blog post! Coming down into Brentford from Bulls Bridge I noticed how clean the canal was compared to the filth in and out of the water on my trip back I think in 2009. As the heavens opened we moored at the bottom of the Hanwell flight just after the River Brent and the canal merge for two days. Brentford and time to pause on a sunny day. We did try booking the lock to take us onto the River Thames but received no answer. The plan was to speak to the lockeeper face to face and go the following day which we recommend if your phone call goes un-answered. The gauging locks where boats were checked and tolls collected according to the type and weight of their cargo. This was done by measuring how high out of the water the boats were sitting. Having come through the Gauging locks we carried on down the River Brent towards the Thames lock so just enjoy the boats moored along the way. The bridge ahead carried the Great Western Railway into Brentford dock. 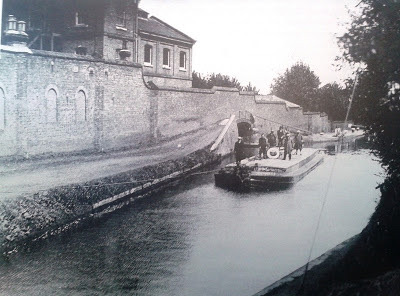 On the right as we approach Thames lock was the site of the old Brentford dock that enabled interchange of cargo between water and rail. Arriving at Thames lock for our 2.30pm booking out onto the River Thames. Aerial view of Brentford dock when it was covered in railway lines and warehouses. It was built in the 1850`s and closed around 1963 and by 1980 it had been developed by the Greater London Council into flats and a marina. The red lines mark the route off the Thames through Thames lock (almost centre of picture) and onto the River Brent that will eventually join the Grand Union canal. Thames lock with the Thames behind me and Nb Valerie sitting moored awaiting the lock to open. Having left the lock first it`s up to me to lead the way. The other boat hesitated but us liveaboards have no fear and I headed towards the 10 foot waves!!!!!!!! Ok he`s made out onto the Thames but still letting me lead. The waves? Well by this time they had subsided....would I lie. These are the moorings next to Tesco at Bulls Bridge on the Grand Union Canal. This was once the area where workboats waited for orders. Some went down to Brentford and loaded directly off Thames lighters. Others might have travelled to the Midlands, returning with coal or goods for export via Brentford and London docks. As soon as I saw these houseboats my thoughts went back to Seattle, Washington, USA. All along the cut in this area are the remains of many canal arms that served industry ranging from margarine to bricks and chemicals to gravel. The map below is from The Grand Junction Canal by Alan Faulkner. Bulls Bridge dock--now full of houseboats--can be seen at the bottom. Our journey to Brentford is to the right. Below is something quite unusual in that the canal passes in a cast iron trough over the railway at the same time as it passes below a road. Known locally as 'three bridges' which I think refers to the three modes of transport. The road bridges the canal, that then bridges the railway, two bridges. Anyway it was constructed by Isambard Kingdom Brunel in 1856 and the reason was a rich landowner didn`t want the trains going through Osterly Park. There were at one time two tracks in use. Here is the Google maps image. Nb Valerie sandwiched between road and rail. Above is the Hanwell Lunatic Asylum pictured in 1926. 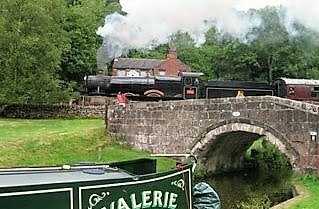 ( courtesy of National Waterways Museum). The towpath bridge can be seen spanning the entrance where boats delivered coal for the boilers and brought out produce grown on the grounds by patients. Built in 1831, very little remains of--lets call it a hospital; Lunatic Ayslum is not a way to describe what might have been a lifetime home for people just like ourselves in many ways. The towpath bridge has gone and the entrance into the hospital is bricked up. To see a map of the grounds including the dock use this link﻿. It can be enlarged. There is still a mental health unit here and also a major NHS general hospital. Some excellent time line info HERE. From a farm to a brewery, a cemetery to a bakery this hospital was very much self sufficient. The bonnie lass and her American Hubby, Joe. We were fortunate to hook up with our dear friends Sally and Joe Horton while we moored up at Kensal Green earlier in the spring, waiting for the endless rain and over cast weather to disperse so we could move down onto the Thames. Theirs was an ambitious travel itinerary including as it does Sally's family and friends in East Anglia and Scotland (she's a bonnie lass from Glasgow). The Hortons were traveling with two of their dear Pullman,Washington friends Roger and LeiAnn so a bit of sightseeing across the Island was also in the cards. Given all of this Les and I did not think it would be possible to spend time with Sally and Joe this trip but bless them--they found us At Kensal Green when they were in London and invited us to meet them at Covent Garden for dinner one evening. Les and I got all dressed up--aftershave,dress slacks, and shined shoes for Les; perfume and jewelry for me! We weren't planning to eat out any place posh--it's just that ANY dinner off the boat is an occasion to dress nice for those of us who live aboard all the time! We really don't have any other excuses for dressing up, so...off we went. A short walk up the canal towpath, a zigzag across Sainsbury's parking lot and we were out on the street at the Ladbroke Grove bus stop. The number 23 picked us up and about forty five minutes later it deposited us at Aldwych street in the theatre district adjacent to Covent Garden. 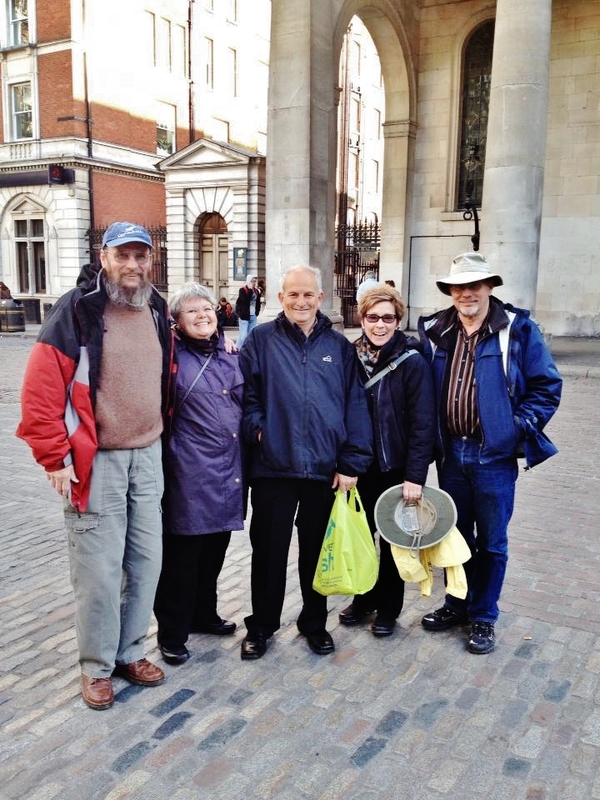 A short walk through the grounds of St. James chapel (the Actors' church) and there we were, just as Sally and Joe came sauntering along with LeiAnn and Roger. Les waved his arms and Sally and I made a beeline for one another. Big hugs and smiles! Introductions ensued. I had never met Roger and LeiAnn although I had eaten at their fine establishment in Pullman many times. Rico's Pub is the closest most folks in Eastern Washington State will ever come to a British pub unless they visit Europe. 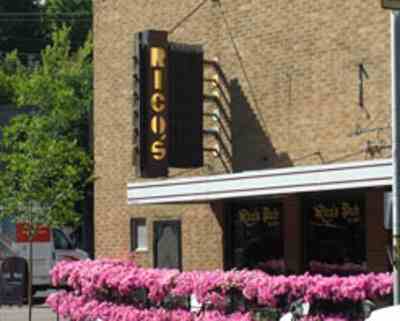 Rico's Public House, Pullman, Washington. Latin which says, "There is no beer in heaven, therefore all beer must be drunk here." Les has fond memories of a beautiful, sunny day boating and fishing on the Snake River aboard Roger's boat, back in July 2011, but he hadn't the pleasure of meeting LeiAnn. Off we all went chattering and laughing, catching up as we walked the London Streets to Porter's--guaranteed for good British food. We waited at the bar for fifteen minutes during which time the men ordered their lagers and ales, Sally took a trip down memory lane with a Harvey Wallbanger and LeiAnn and I ordered mead. Soon we were seated at our booth and having a great time. As we six chatted I discovered that Roger and Lei Ann had lived in Alaska for some time in the 1970's during the North Slope Pipeline boom. It was great to reminisce about things Alaskan. The menu at Porter's is extensive and it was hard to narrow down one's choice. 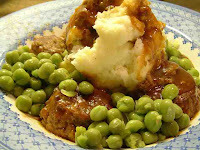 During their travels the past few weeks through Anglia and the Cotswolds, Roger had taken a liking to a Brit dish called faggots, of which I had never heard. Faggots date back to at least the mid 1800's and were a means of using the heart, liver and offal of pigs, mixed with herbs and bread crumbs, shaped into patties and often cooked in a crock of gravy. At Porter's this dish is made from minced beef, onion, carrots and herbs, and cooked in an onion and ale gravy. Les and Joe had the braised lamb shank pie which they both agreed was superb. I had the chicken and mushroom pie which was okay. Sally ordered Steak and Kidney pie and I cannot remember what LeiAnn decided upon--the mead quite went to my head! 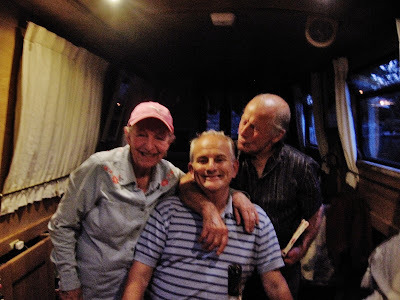 At the end of the evening we all stumbled out laughingly into the street in high spirits as Les gave Sally details of how to take the bus from their nearby hotel to the canal where we were moored. LeiAnn and Roger had never been aboard a narrow boat. 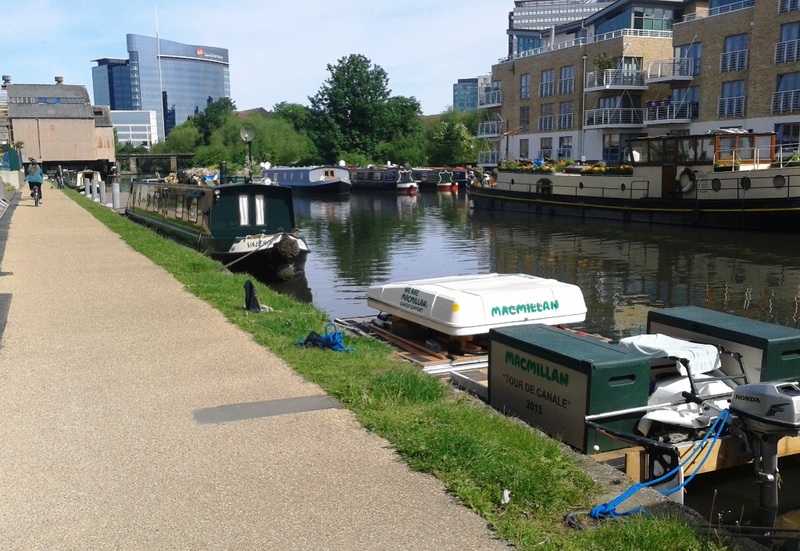 We planned to wind the boat before they arrived, pick up our four friends and cruise through Little Venice, past the London Zoo, wind before Camden locks and end at Paddington Basin. The next morning dawned miserable, cold, and rainy. Les walked up toward the bus stop and found the two couples on the towpath, huddled under a bridge! A quick walk back to NB Valerie and a warm up with coffee, tea and carrot cake--using Joe's incredible, best-ever recipe. With some Django Reindhardt music in the background, we set off in the rain--the men in back and Sally, LeiAnn and I inside. A pair of swans approached the boat and LeiAnn fed them from the window....all too soon our cruise was over. We cut it short due to the lousy weather and just headed into Paddington Basin where we parted from our friends. They took the underground onward in their journey and we moored up for the night. 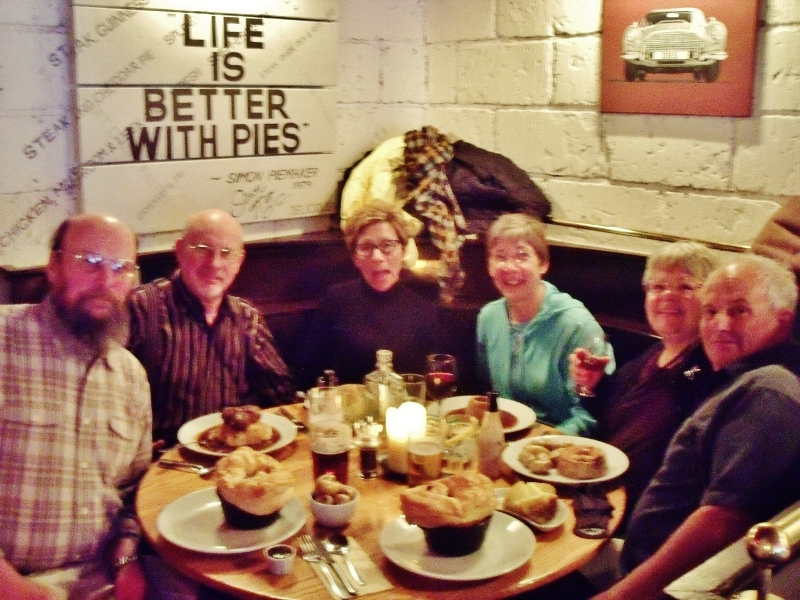 A full table and mile high pies at Porter's in Covent Garden, London. 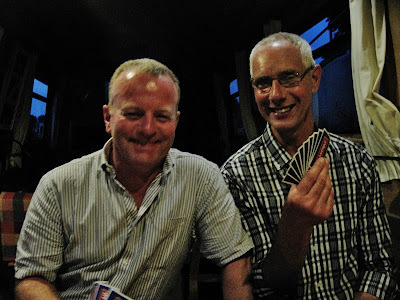 Thank you Sally and Joe, for taking time from your busy travel schedule to spend a bit of it with us, and thanks for introducing us to LeiAnn and Roger--the craic was was grand!! We have been members of RCR for some six years and have always found the service good. Over the past two years they have introduced `parts replacement insurance` and this came into force when our drive plate, clutch for car drivers, gave up. The first sign was the engine would not start and upon removing the starter it was found parts of the drive plate had broken up and blocked the starter from engaging. Now within 24 hours the part was collected from Stafford and fitted. Cost? £50 inclusive of labour. This cost is the excess the boater has to pay. So total premium is £128 per annum. Parts covered include starter, alternator, fuel pump, injector pump and much more. List HERE. This plate has lasted nearly 3 years and for a boat in continuous use that`s not bad. So mobile again just in time for Doug and James to come aboard for a meal on Nb Valerie. Happy Anniversry Darling! Two years Today! !